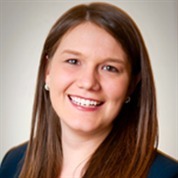 Melanie VanOverloop is an attorney at Rapoport Law Offices, P.C. specializing in personal injury cases including construction negligence, products liability, medical malpractice, premises liability and auto liability. Melanie has extensive courtroom experience and has tried numerous cases to verdict - all of which have resulted in positive outcomes for her clients. Melanie has proven to be a fierce advocate for her clients. In her first year of practice she obtained a record setting settlement in the state of Illinois.for a 96 year old man who slipped and fell on a freshly mopped floor. Melanie was part of a team that obtained a $3,900,000.00 settlement package on behalf a Local 1 Ironworker who was injured on a construction project. That same year she was part of a trial team that obtained a $3,200,000.00 settlement package for a Local 1 Ironworker who suffered extensive nerve damage on his dominant right arm while installing rebar in an unsafe work area. In addition to her desire to assist people in need, Melanie strives to become an accomplished trial lawyer and is pleased to be learning from some of the top trial lawyers in the nation at Rapoport Law Offices, P.C. In 2014, Melanie was part of a trial team that obtained the second highest verdict in LaSalle County for a construction accident.